Lawmakers are still trying to sort out their plans for judicial redistricting less than two weeks before candidate filing commences for judicial office and it’s not at all clear where the finish line will be. 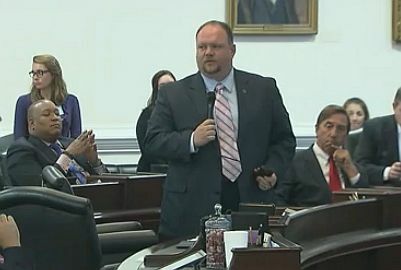 Rep. David Lewis (R-Harnett) all but promised last week that a Friday committee meeting at which two bills were approved would be the end of judicial redistricting, but Sen. Ralph Hise (R-Mitchell) said Monday that there were still imbalances across the state that could be dealt with. The Senate Committee on Elections, which Hise chairs, gave a favorable report Monday to House Bill 717, which was changed from a statewide judicial redistricting bill to a more targeted measure that reduces the state’s judicial divisions from eight to five, redistricts some western counties, prohibits the State Board of Elections and Ethics Enforcement from labeling judicial seats by incumbents’ names and attempts to change the rotation and assignment of Superior Court judges. Lewis, in contrast, said Friday he didn’t expect that there would be any constitutional amendments dealing with judicial reform, and particularly judicial selection. Senate lawmakers had been pushing for a “merit selection” plan for the appointment of judges while House members were promoting statewide judicial redistricting. The other two bills that have been gaining steam over the past two weeks and that are expected to pass this week are: Senate Bill 757, which redistricts Superior and District Court districts in Wake, Mecklenburg, New Hanover and Pender counties; and HB 1037, which redistricts prosecutorial, Superior and District Court districts in Duplin, Jones, Sampson, Onslow, Hoke, Moore, Montgomery and Stanly counties. Lawmakers argued Monday night and Tuesday morning over those two bills. Both still passed and have been sent to the Senate for concurrence. 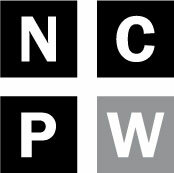 If all three bills currently advancing become law, around 3.5 million people, or roughly a third of North Carolinians, would be impacted. House Minority Leader Darren Jackson (D-Wake) objected to how fast changes were moving through the legislature — a pace, he said, that left members without an ability to really grasp the causes and effects of the legislation. Jackson said that the changes would mean that he, as a Wake County voter, would only get to vote for one-seventh of the district court judges there, but Lewis, as a voter in Harnett County, a more rural area, would get to vote for all of the judges running for election there. In raising concerns about the residency requirements contained in SB 757, Rep. Marcia Morey (D-Durham) pointed out that the bill takes effect Jan. 1, 2019 but purports to apply to elections that will be held in 2018. Will, she asked, District Court judges in whole counties that are being carved into smaller areas be able to file anywhere until the law takes effect? “The confusion, I think, is apparent,” she said. She also argued during two separate House sessions that District Court judges have jurisdiction over entire districts and denying voters their right to vote for someone they may come before in court is not only bad policy, it’s disenfranchising. Rep. Scott Stone (R-Mecklenburg) said he didn’t believe there was any confusion at all about SB 757. “If there is something confusing about the election of judges, it’s the way it’s done now in Mecklenburg County,” he said. 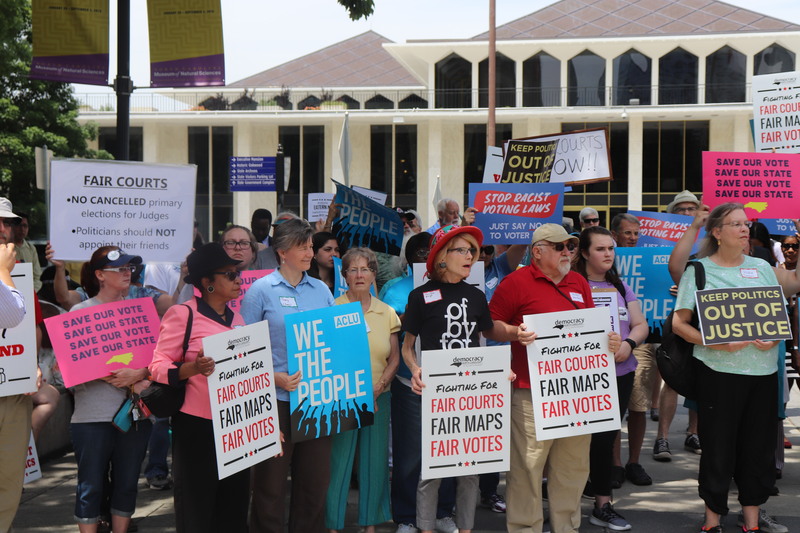 He, like other Republican members, pointed to a population imbalance in Mecklenburg County Superior Court districts as evidence of a need for judicial redistricting, but Morey said it wasn’t fair to drag District Court into that same argument. “To compare the functions of a Superior Court judge to a District Court judge is like comparing an apple to a banana,” she said. Morey also criticized Republicans for proposing and passing judicial redistricting measures gradually — something that seems to contradict previous promises to overhaul the entire system after piecemeal changes over the years created what many have described as a “hodgepodge” system. “We’re going right back to where we started, going to piecemeal bills for certain districts,” she said. When asked by Policy Watch what made piecemeal redistricting okay now but not in the past, Hise said specific challenges and constitutional issues identified in Mecklenburg County and other areas needed to be addressed, even if lawmakers couldn’t agree on a complete system overhaul. Members of the public disagree. 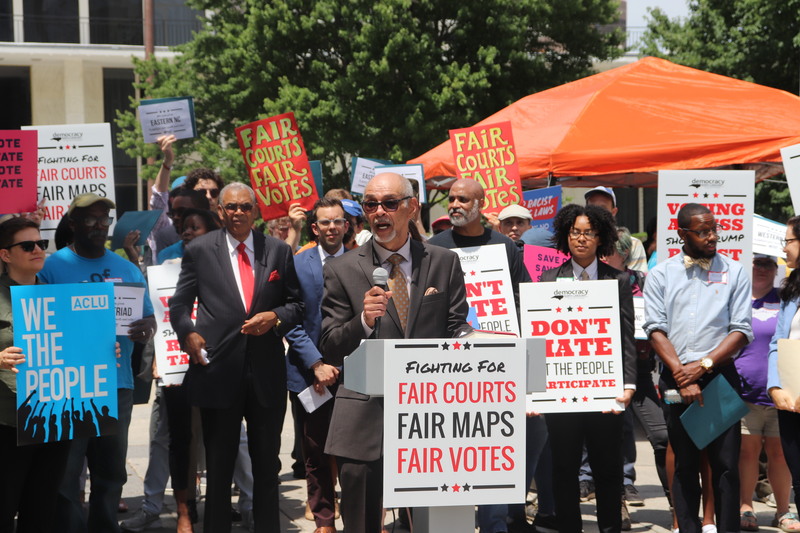 Dozens of people gathered outside the legislature Tuesday afternoon to make their opposition to judicial redistricting known. “Fair courts now! Fair courts now! Fair courts now!” they chanted. Allen said lawmakers wanted to take justice hostage to deprive people of color and people of good will of their rights. “Justice may be blind, but she is not stupid, and neither are the people of North Carolina,” he said. 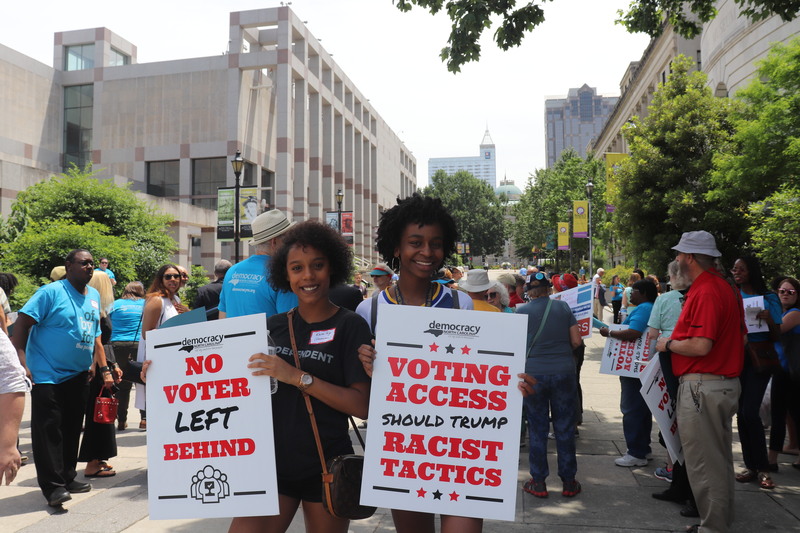 The event was sponsored by Democracy North Carolina, NAACP of North Carolina, North Carolina Voters for Clean Elections and Progress NC. Morey also spoke at the event. She thanked the people in attendance for making their voices heard and said it had worked to stop statewide judicial redistricting and as well as proposals to replace the election of judges with appointment systems like merit selection. “You all have made a difference,” she said. She added though that efforts to change the judiciary for partisan gain were not over.